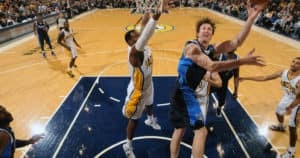 Indianapolis has a rich history in basketball, making it a great city for watching an exciting game. Whether you’re interested in a professional or amateur game, here are some of the top places to watch when you check out the following options. Situated in downtown Indianapolis, Bankers Life Fieldhouse is an indoor arena that’s home to the NBA’s Indiana Pacers. When you want to join thousands of other fans to cheer them on, this is the place to go. If you get hungry during the game, there are over 100 concessions in the arena serving some of your favorite game day food, including barbecue chicken, pretzels, pizza, hot dogs, nachos, and popcorn. Another great place to check out some live basketball games is Hinkle Fieldhouse, the arena where the Butler Bulldogs play. Situated on the campus of Butler University, it was once the largest basketball arena in the country. Today it’s a United States National Historic Landmark and the sixth-oldest college basketball arena still in use. In 2014, the arena underwent major renovations to upgrade the concessions, put up a new scoreboard, add more bathrooms, and update the main arena with more comfortable seats. If you don’t have the opportunity to watch a basketball game live, head to Ale Emporium to see all the action on one of the 80 flat-screen televisions or 12 projection screens. If there’s a lull in the game, you’ll find plenty of other fun with the arcade games, shuffleboard, and jukebox. You’ll also be able to please any appetite with a menu that offers pizza, sandwiches, burgers, and an extensive selection of local, on tap, and bottled beer. Moe & Johnny’s is a neighborhood sports bar filled with plenty of unique history. The building was originally built in 1922, there are old garage doors as dining room windows, and there’s even a porcelain gas pump cover that was found in the rafters wrapped in newspapers dated 1928. If you want to enjoy some good food while you’re watching a basketball game, Moe & Johnny’s has a menu that includes stonebread pizza, burgers, and a variety of sandwiches. To wash down your meal, you can order wine, beer, scotch, bourbon, martinis, or a staff-created cocktail. With dozens of flat-screen televisions in the downtown location, Kilroy’s Bar N’ Grill offers a great seat for all the action. As you’re waiting for the game to start, make sure you place an order for Kilroy’s Famous Stuffed Breadsticks. Made from pizza dough rolled at the restaurant, these huge breadsticks come stuffed with pepperoni and mozzarella cheese. You also get marinara and cheese sauce on the side for dipping. If you arrived with an appetite, you can also order a wrap, tacos, burgers, sandwiches, or a specialty pizza. When you’re looking for the best spot in Indianapolis to catch a basketball game, you can’t beat the fun at one of these top destinations.